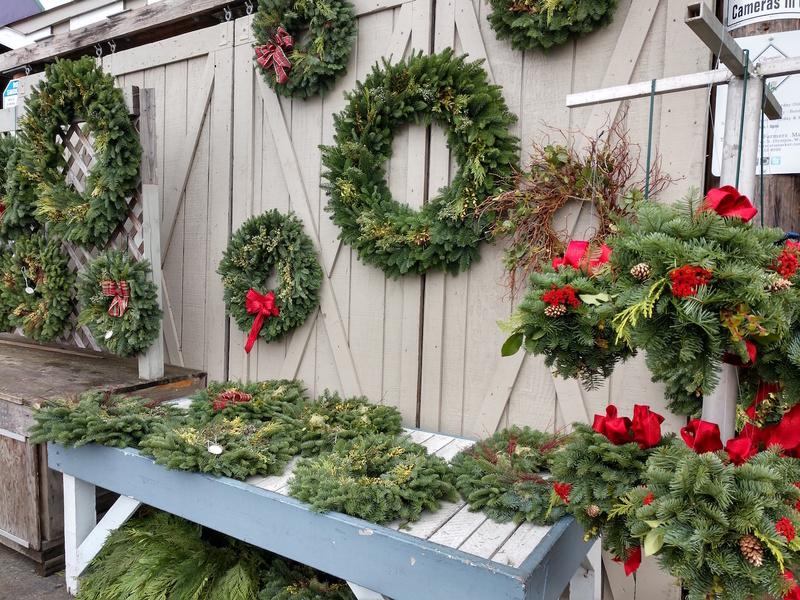 Holiday magic awaits you at the Olympia Farmers Market every weekend until Christmas with a bonus on Christmas Eve day. Need to get your hands on a tiny house for a fairy? How about a fragrant evergreen arrangement for your table? Maybe you are looking for a unique gift that’s locally made, environmentally aware and really cool. All can be found at the market. Yes, it’s worth zipping up your jacket and walking the aisles of the market, especially with live music between 11:00 a.m. and 2:00 p.m. Shop a little, sip a hot beverage and enjoy. 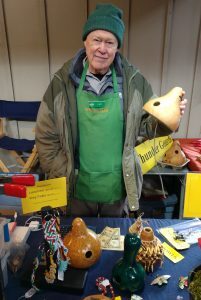 Happy Hen Farm owner Lee Jacobson fashions thunder gourds. The amazing sounds must be heard to be fully appreciated. 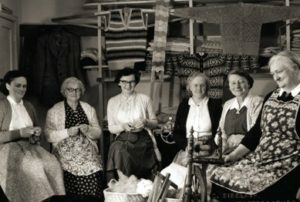 His wife Ora is most often at home weaving fabric to make fiber crafts such as catnip toys and bookmarks. The couple has been bringing their treasures to the Market for 22 years. 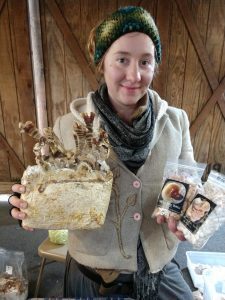 Ava Arvest of The Myco-Uprrizing is Now will dazzle you with mushroom possibilities. “I have always loved mushrooms,” said Ava who mixes science and sense into a fascinating story about these shapely and somewhat mysterious growths. Mushrooms are packed with nutrients and used in all sorts of medicinal ways. They can grow with limited resources and yet be prodigiously productive. Here’s an idea. Consider retiring your Christmas tree (after the holidays) to a shady part of your yard. Drill holes and fill with Phoenix oyster dowels. These are little pellets packed with mycelium for growing your own mushrooms. Next year you will have a crop of mushrooms. No room for parking a tree? Don’t worry. Pick from a variety of bags that can be brought indoors. Ava will show you exactly what to do. Brother Bliss has been away studying with various out-of-area chocolatiers allowing his inspirations to take fruit – literally and figuratively. Johnson Berry Farm made a special jelly just for Blissful Wunders, which will be unveiled in new chocolates on December 15. You will find holiday boxes and new forms to tantalize your sweet tooth. He’s cooking with organic coconut oil and having all sorts of fun. Part of the adventure of the holidays is getting ready. A trip to the Market checks off a lot of boxes, both fun and practical. There are still fresh vegetables to add to your table, lots of seasonal decorations and plenty of gift ideas. 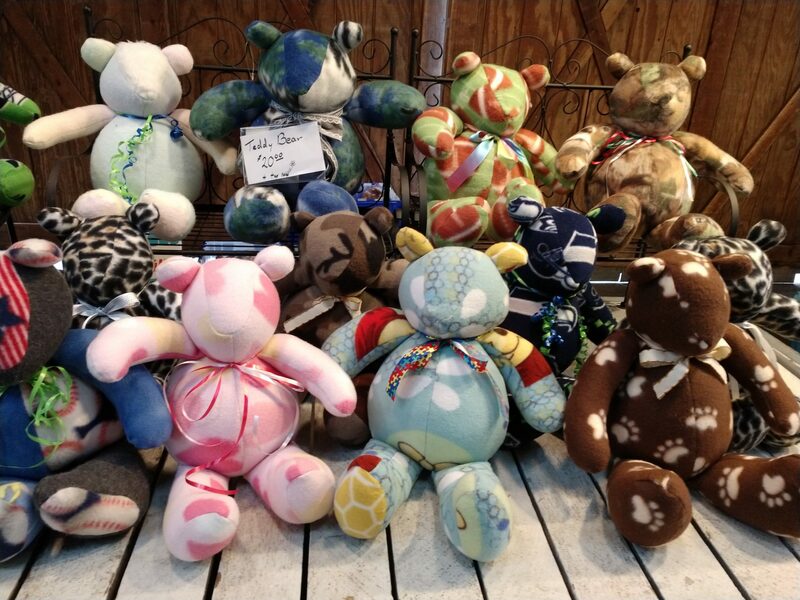 Our talented artisans are bundled up and glad to share their creations with you. Listen to Mucho Gusto, No Strings Attached, Hook Me Up and Ken McDermid or check the Olympia Farmers Market website for other information. 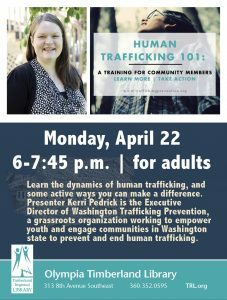 You can also call 360-352-9096. Park for free, bring your bags and find your own bit of holiday magic right downtown. It’s all there waiting for you.